One complaint against small personal alarms is that they are difficult to handle in a high stress situation. Something like " I can't find the button to tun it on!". Not so with this newest version of this high tech concept. The side panels are the "turn on" so you just have to hold and squeeze to turn on the alarm. The grey button on the front will turn it off. No recessed buttons to find, no pull cords, no fumbling. Its about as easy as it can possibly get. 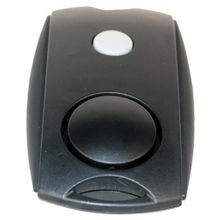 The Mini Personal Alarm with Belt Clip has a very sleek and compact design, but don’t let its small stature fool you. This easily activated alarm will emit an ear piercing 120dB alert that will send your aggressor fleeing for the confines of a sound proof room. You can deactivate this alarm just as easily as you activated it, with the click of a perfectly located button. This alarm fits easily in your pocket, purse, can be clipped onto your belt, or attached to a key chain. Anyway you choose to carry it, it will be nothing but beneficial to your safety. Uses replaceable AG13 batteries (3) (included).